This was a ludicrous, ridiculous game from tip off. The Houston Rockets hosted the recently-frisky Brooklyn Nets and lost a game that wasn't just somehow a loss, or somehow an overtime game, or somehow close or somehow a huge night for James Harden or somehow a huge night for Spencer Dinwiddie and Jarrett Allen. It was somehow everything. It was bad, it was good, and it wasn't actually good at all. At least it's over. Sometimes things are bad and disappointing. I think I say that a lot, but sometimes it's true (100% of the time). While some claimed this game to be an incredible affair full of intrigue and action, it was Bad, Actually, and not just because it was a loss. But it being a ludicrous and heartbreaking loss isn't helping on that front. This game began as a frustrating and laughable outing and never budged from that spot. A lot of points and a lot of three point attempts are interesting, and this game had more of the latter than any game in NBA history. It featured James Harden going absolutely berserk. None of that makes it anything other than a gruesome farce, dating back to before the game even began. Here's some wretched backstory: Chris Paul, Clint Capela, and James Ennis were all out with injuries and Eric Gordon came back on a minutes restriction. On top of this, it was brought to light that notable diamond in this notable rough, Danuel House, would be heading down to the G-League. This isn't anyone's desired outcome, of course, but an unavoidable outcome of the contract standoff between House and Houston. General Manager Daryl Morey and the Houston front office would love nothing more than to give House more money for more years, but in trying to take less money now, House will likely give himself less money down the line, but not on Houston's payroll. Make sense? No, of course it doesn't. Even with an understanding of the mechanics behind it, the whole affair fits in only as a further iteration of the absurdist play that is this Rockets season. Even 2015-'16, the season we do not mention, was less of a joke. 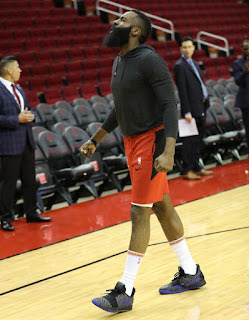 The level of play James Harden brings to the table only seems to offend fate further as the Rockets stumble into new, less believable ways to lose. There is the important reality that despite Harden's pedestrian 58-point supernova, this was a game the Rockets gave away. They gave up 34 points in the first quarter and were forced to play catch-up for half the game. Perhaps if they had simply gone up 13 in the first instead of the fourth, they might been able to put away a frisky nets team. There's no way to know what could have been, but all we need to do is look at the tape to see what was. Spoilers: what was was bad defense. That was, at least, the part the Rockets can take home with them, internalize and struggle against. In being the aspect of this loss for which they are most culpable, their poor defensive showing is in a way a ray of hope. If they could have tightened that up, they almost certainly win the game, and this is at least something they can control. The other hand is Spencer Dinwiddie drilling three threes in a row in the last minute of regulation to force overtime. On the other hand from that are 63 attempted threes by the Rockets in regulation, as well as 58 points on 34 shots, 10 rebounds and 6 assists from James Harden. But on the other hand from that (this is that first other hand again, the one with Dinwiddie on it. Keep up) are a pair of blown leads: a 13-point lead in the 4th quarter and a 7-point lead with about a minute left in overtime. There were heroes on both sides, except that both sides were leaning into chaos and madness and there are no more heroes any more. The game began with the Rockets going ice-cold while the Nets shot the lights out, and regulation ended the same way. PJ Tucker hit a dagger three to put the Rockets up 8 with 1:09 left in the fourth quarter and then extremely fresh face James Nunnally hit a similar dagger to put the Rockets up 7 with 1:28 left in overtime. If the Rockets had managed a single point after that last one, they might have won, but instead the Nets scored 10 points in a minute and a half, which was both impossible and incredibly predictable. Brooklyn's best success was when they doubled James Harden hard and just let the rest of the Rockets team have open three point looks. This is an incredibly bad plan if you think the Rockets who are good at shooting are good at shooting. But, ah, if the Rockets who are good at shooting are bad at shooting, actually, then it's a great plan. This is not to take anything away from a gutsy, fun young team in the Brooklyn Nets. No, this game was actually to take everything away from a tired, depleted, disappointing team that also has the league MVP playing at a higher level than he did last year. All of these exasperating things are true at the same time. The Rockets are a shambles and also amazing and also have made many mistakes and have done everything right and this is completely their fault and it isn't their fault at all. Like this ongoing Mr. Bean gag of a season, this game meant nothing and gave nothing for the Rockets. There are no lessons and there was no point. James Harden's brilliance is being wasted, in the way that every great season that doesn't end in a championship is a waste. It's just a lot more insulting than normal right now.